Polynesia (from the Greek words meaning "many islands") is a large grouping of over one thousand islands scattered over the central and southern Pacific Ocean. The term "Polynesia" was coined by Charles de Brosses in 1756, and originally applied to all the islands of the Pacific. In 1831 Jules Dumont d'Urville introduced the terms Micronesia and Melanesia in a lecture to the Geographical Society of Paris. This division into three distinct Pacific sub-regions remains in widespread use today. Polynesia may be described as the islands within a triangle with its corners at Hawaiian Islands, New Zealand, and Easter Island. 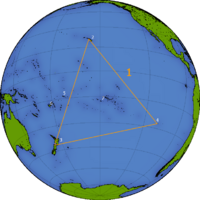 A Polynesian island group outside of this great triangle is Tuvalu. There are small Polynesian enclaves in the Solomon Islands and in Vanuatu. The Pacific Islands—except New Zealand and Easter Island—lie within the rainy tropics or the humid subtropics. In these climates, there are no abrupt seasonal changes as in the temperate zones. Temperatures typically average close to 80 °F (27 °C) most of the year. There are coral atolls, volcanic islands, many with active volcanoes, and some of the highest mountains in the world. The vegetation varies. On coral atolls, soils are thin and sandy. Vegetation is sparse and consists of shrubs, small trees, grasses, and coconut palms. The continental islands typically have mangrove forests on the coast, palm trees further inland, and rainforests in the interior. 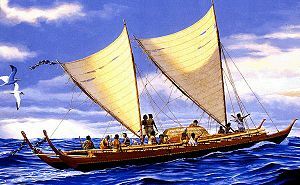 Polynesian history covers four eras: Exploration and settlement (1800 B.C.E. to 700 C.E. ), pre-European growth (700 to 1595), European exploration and colonization (1595 to 1945), and modern times (from 1945 to the present). Maternal mitochondrial DNA analysis suggests that Tongans, Samoans, Niueans, Cook Islanders, Tahitians, Hawaiians, Marquesans, and Maori are genetically linked to indigenous peoples of Southeast Asia. Between about 3000 and 1000 B.C.E., speakers of Austronesian languages spread from Taiwan into the edges of western Micronesia and on into Melanesia. In the mid second millennium B.C.E., a distinctive culture appeared suddenly in north-west Melanesia, in the Bismarck Archipelago. This culture, known as Lapita, is distinctive for its large permanent villages on beach terraces, and the making of pottery. Between about 1300 and 900 B.C.E., the Lapita culture spread 6,000 kilometers east to Tonga and Samoa. 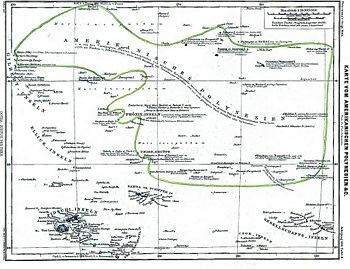 Adventurous seafarers by 700 C.E., the Polynesians had settled the vast Polynesian triangle. By comparison, Viking navigators first settled Iceland around 875 C.E. Evidence indicates that the Polynesians were motivated to expand to ease the demands of burgeoning populations. Each local population developed its political structures in diverse ways, from fully-developed kingdoms in some islands, to constantly warring tribes, or extended family groups on others. On low elevation islands, where communication was unimpeded, there was no conflict. But on most high elevation islands, warring groups inhabited various districts, usually separated by mountain ridges, with carefully drawn lowland boundaries. In 1595 Spanish navigator Álvaro de Mendaña de Neira was the first European to reach a Polynesian island, the Marquesas Islands. But the European exploration of Polynesia was of little more than passing interest because of the scarcity of mineral or gemological resources. British navigator Captain James Cook was the first to attempt to explore Polynesia. Europeans did bring changes, however. They introduced diseases to which the Polynesians had no immunity, slavery to supply plantations in South America, and Christian missionaries. Many colonizing powers, pressured by missionaries, forcibly suppressed native cultures and languages. By the early 1900s, almost all of Polynesia and its outliers were colonized or occupied by Western colonial powers, or subsumed into the sometimes-overlapping territorial claims of Japan, the United Kingdom, and France. However Tonga (or the "Friendly Islands") maintained its independence, at least nominally. The Japanese attack on Pearl Harbor, in south-central Oahu, Hawaii, brought the United States into World War II in 1941. A number of islands were used by the Allies as military bases, including as far east as Bora Bora. After World War II, political change came more slowly to Polynesia than to the other overseas colonies. Although sovereignty was granted by royal proclamation to New Zealand as early as 1907, this did not go into full effect until 1947. Polynesians settled the vast Polynesian triangle by 700 C.E. Migration by Polynesian people in great ocean-going canoes is impressive considering that the islands settled are spread out over great distances—the Pacific Ocean covers nearly a half of Earth's surface area. Most contemporary cultures, by comparison, never voyaged beyond sight of land. Knowledge of the traditional Polynesian methods of navigation was largely lost after colonization by Europeans. Explorer Captain James Cook accepted the view that migration occurred when large groups of Pacific islanders were driven off course in storms and ended up hundreds of miles away. Late nineteenth century writers told of heroic Polynesians migrating in great coordinated fleets. In the mid-twentieth century, Thor Heyerdahl argued that the Polynesians had migrated from South America on balsa-log boats. In the late 1960s, Dr. David Lewis sailed his catamaran from Tahiti to New Zealand using stellar navigation without instruments. Ben Finney built a 40-foot replica of a Hawaiian double canoe and tested it in a series of sailing and paddling experiments in Hawaiian waters. At the same time, ethnographic research in the Caroline Islands in Micronesia revealed that traditional stellar navigational methods were still in everyday use there, as in the Sulu Archipelago in the Philippines. Polynesian navigators probably used the stars, the movement of ocean currents and wave patterns, the air and sea interference patterns caused by islands and atolls, the flight of birds, the winds, and the weather. Scientists think that long-distance voyaging followed the migration and seasonal paths of birds. A voyage from Tahiti, the Tuamotus, or the Cook Islands to New Zealand might have followed the migration of the Long-tailed cuckoo. It is also believed that Polynesians used shore-sighting birds, like the Frigate bird. Polynesia includes six independent nations (New Zealand, Solomon Islands, Tonga, Tuvalu, Vanuatu, and Samoa); two political units that are parts of larger nations (Hawaii is a state of the United States, and Easter Island is part of Chile); two self-governing entities that remain linked with their former colonial power (Cook Islands and Niue with New Zealand); and five territories administered by other nations—New Caledonia, French Polynesia, and Wallis and Futuna—all administered by France, Tokelau administered by New Zealand, and American Samoa administered by the United States. Polynesian governments vary. The independent nations replaced hereditary chiefs with constitutions providing for executives and legislatures. In Tonga, politics are controlled by a hereditary king, who serves as head of state and appoints the head of government. In the nations that have entered pacts with the United States or New Zealand, the pattern is for local self-government with matters of defense overseen by the foreign power. Internal self-government is also the rule among the territories of overseas powers, with elected legislatures and executives. Some elected representatives are sent to the national legislature in the overseas capital. French Polynesia sends one voting member to each house of the French National Assembly in Paris. The territories are dependent on the mainland government for economic subsidies, and often have little control over political decisions. With the exception of New Zealand, most independent Polynesian islands derive much of their income from foreign aid. Some families encourage their young people to go where they can earn good money to remit to their stay-at-home relatives. Many Polynesian locations supplement this with income from tourism. Some have more unusual sources of income, such as Tuvalu which marketed its '.tv' internet top-level domain name, or the Cook Islands' reliance on postage stamp sales. A very few others still live as they did before western civilization encountered them. Most Pacific Islanders grow crops for their own use. These include bananas, breadfruit, sweet potatoes, yams, cassava, and taro. Coffee plantations, introduced in the colonial era, are important in New Caledonia and Papua New Guinea, and vanilla is raised for export on Tonga. Coconut, the source of copra, or dried coconut meat, is the most common crop and is sometimes the major export. Extensive rainforests in the Solomon Islands provide forest products for export. Fishing is a source of food and an export earner for some economies. Pacific Island nations have had fisheries disputes with the United States and Japan. French Polynesia exports cultured pearls. New Caledonia has rich deposits of nickel, chromite, and iron ore. Large reserves of petroleum are believed to lie in the continental shelves along the Pacific Rim. Fields of manganese nodules, potato-sized nuggets of iron and manganese oxides that can contain copper, cobalt, and nickel have been found on patches of the ocean floor. Manufacturing is limited to handicrafts and food processing. Polynesian countries trade with their former and current colonial powers the United Kingdom, the United States, New Zealand, Australia, Germany, and France as well as Canada, and increasingly, Japan. Tourism has grown, with Japan the largest single source of visitors. But since most tourist facilities are foreign-owned, much of the profit from tourism leaves the Pacific. Jobs in the hospitality industry are seasonal, and only low-skill jobs are open to islanders. Growing numbers of visitors can harm coral reefs and rain forests. Shipping networks carry cargo and passengers between the hundreds of inhabited islands and atolls. Most Pacific Island nations are well served by satellite technology, and their access to telephone, television, and radio services is good. As most Polynesian nations do not produce any oil or natural gas, most fuels must be imported. In rural households, wood from forests is an important source of energy. Polynesia has a total population of just over six million, but the Polynesian population is estimated at about three million people spread over one thousand islands. Of New Zealand's four million people, about 260,000 identify themselves as Polynesian. Auckland has the largest concentration of Polynesians in the South Pacific. In addition, New Zealand has about 600,000 Maori people. Of Hawaii's 1.2 million people, there are about 116,000 native Hawaiians or other Polynesians. Polynesians, whose features are Mongoloid, are tall and have lighter skin than Micronesians or Melanesians. Their hair is dark and either straight or wavy but not curled. Polynesian languages are all members of the family of Oceanic languages, a sub-branch of the Austronesian language family. Pre-Christian Polynesians worshiped many gods, each of whom represented some aspect of their environment. They often believed their founding ancestors were gods, and had altars and houses for them. Offerings sometimes included human sacrifices. Valuable tools or strong chiefs or warriors were sometimes thought to possess mana, a force that gave an object or person prestige or authority. 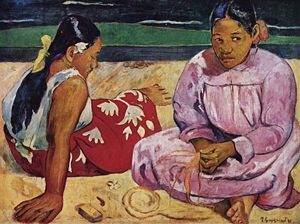 Because of an openness to new ideas and relatively large numbers of competitive sects of Christian missionaries, Polynesians readily adopted Christianity. Polynesians today are mostly Protestants of various groups, but with a large minority who are Roman Catholic. Anthropologists term the Eastern Polynesian system of kinship the Hawaiian system. 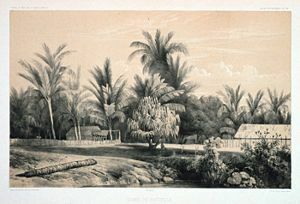 Settlements by the Polynesians were of two categories: the hamlet and the village. The size of the island determined whether or not a hamlet would be built. The larger volcanic islands usually had hamlets because of the many divisions that could be created across the island. Food and resources were plentiful and these settlements of four to five houses (usually with gardens) were established to maintain independence among the divisions. Villages, on the other hand, were built on the coasts of smaller islands and consisted of thirty or more houses. Usually these villages were fortified with walls and palisades made of stone and wood. However, New Zealand demonstrates the opposite—large volcanic islands with fortified villages. Polynesia can be divided into two distinct cultural groups, East Polynesia and West Polynesia. West Polynesia is characterized by high populations. It has strong institutions of marriage, and well-developed judicial, monetary, and trading traditions. It comprises the groups of Tonga, Niue, Samoa, and the Polynesian outliers. Eastern Polynesian cultures reflect the smaller islands and atolls including the Cook Islands, Tahiti, the Tuamotus, the Marquesas Islands, Hawaii, and Easter Island. Eastern Polynesians adapted their culture to a non-tropical environment when they settled New Zealand. Although pre-European Polynesians had no metals, they developed a complex civilization by using available materials. For example, coconut palm leaves provided matting and roof thatch, the fibrous material covering the coconuts could be made into baskets, the shells could become household containers and other utensils, while the meat and liquid provided various foods and beverages. Religion, farming, fishing, weather prediction, out-rigger canoe (similar to modern catamarans) construction, and navigation were highly developed skills because the population of an entire island depended on them. Pre-colonial Polynesians also devised snares, traps, nets, harpoons, and special hooks that do not snag on reefs to catch fish. There are the giant stone statues on Easter Island and polished, exquisitely carved war clubs made throughout the region. Skills were handed down through their families. Craft items, like tapa cloth made from tree bark, remain important, especially for the tourist trade. Other art forms include ceremonial dancing and singing. 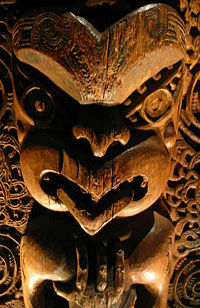 Woodcarving is practiced throughout Polynesia. Independence is not the only influence affecting modern Polynesian society. The primary driving forces are the ever-increasing outside influences, through improved air communications as well as through vastly improved telecommunications. Tourism has had a tremendous impact on the direction of the development. The culture has adapted to accommodate the interests of outsiders, while retaining native traditions. This page was last modified on 31 March 2019, at 22:15.